After I have cooked this EASY healthy red wine beef stew at here for my family, my beef-loving husband and son have been nagging and reminding me that they want MORE beef stew. Not bragging but I know that my beef stew is good!!! However, instead of cooking the same recipe again and again, I want to try another different recipe. I'm not a boring person, you know! LOL! Having said that, I have to clarify that I'm doing this NOT because my previous recipe is not good! Simply because I have seen another highly reviewed beef stew recipe by Barefoot Contessa, also known as Parker's Beef Stew at here, here and here and I wonder if I can cook a BETTER beef stew! I have to say... I love this kind of domestic challenges! LOL! Why didn't I cook the exact Parker's Beef Stew recipe? I like this recipe but there are some little things that I don't really like and so I have decided to incorporate only the things that I like into mine. What I like about Parker's Beef Stew? Unlike most stew, the beef in this stew is marinated in red wine overnight and so you can imagine... the beef is very infused with red wine flavours. Unlike most stew, this stew is cooked with BACON and it makes the stew extra flavoursome! And of course, you can omit the addition of bacon if you don't prefer to have bacon in your stew. Unlike the stew that I cooked before at here, the gravy of this stew is thickened after the beef has been cooked to tender and so you can adjust the consistency of the gravy according to your liking. What I don't like about Parker's Beef Stew? I just want my beef stew to be classic... with beef, potatoes, carrots and mushrooms and prefer our stew not to have the unusual peas and sun-dried tomatoes. Instead of using a Dutch oven to bake my stew for about two hours, I have used a pressure cooker to cook mine within 50 mins. Faster and it works perfectly fine for us. Instead of using 2 1/2 cups of red wine, I have reduced mine slightly to 2 cups to moderate the amount of tannin taste in our stew. What is the right red wine to use? Cabernet Sauvignon is the most appropriate to use due to its bold full-bodied aromas and moderate tannin taste. Cabernet Merlot or Merlot tends to be sweeter with lighter tannin taste. Shiraz tends to be richer in taste with a hint of spicy, peppery and smoky aromas. Both Merlot and Shiraz are ok to use too but I would say Cabernet Sauvignon is the best being sort of in-between Merlot and Shiraz. Can young children eat this stew? Yes because the alcohol content from the wine will be fully vapourised after cooking the stew for more than an hour. My son ate heaps of both stews that were made from the Easy recipe at here and also THIS Extra Flavoursome recipe and he was acting usual after eating his food! Double and triple confirmed that there is no drunken boy living in my house! LOL! Is this recipe better than one at here? Yes! 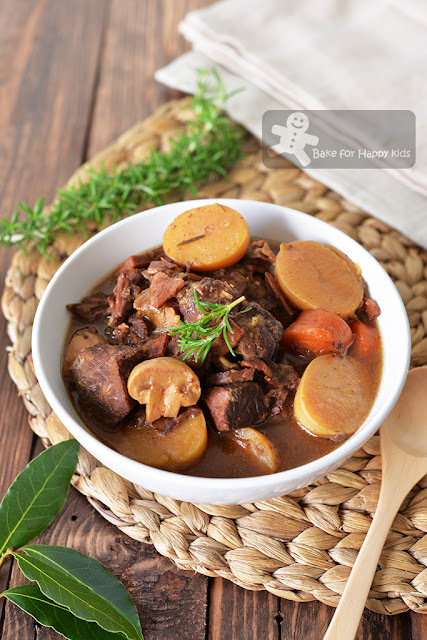 Use this recipe if you are after a beef stew that is more flavoursome (due to the overnight marination and the addition of bacon) and has less thicker gravy. No!??? Use the recipe at here if you are after an easy hassle free recipe because this recipe requires more time for several additional preparation and cooking steps. I have to say that the recipe at here is so much easier to cook as there is no thickening of gravy required after the beef is cooked to tender. Plus, I have noticed something... the beef that has been soaked in red wine won't sear and brown so well like the beef that are not soaked in read wine. And, it is actually quite frustration when the flour coating on the soaked beef tends to be sticky and get stuck onto the pan more easily. To fix this problem, you will need more cooking oil to sear the beef and also a lot of pan-scraping! Well, pro and cons... At least, the good thing is this beef stew with soaked beef is more tasty! ... whereas the other stew at here with no bacon and require less oil to cook is actually healthier. Hmmm... so difficult to decide, huh!!! Wow! There is so much flavours packed in every piece of these tender beef! Not bragging again but I know that I have cooked another delicious beef stew!!! LOL! Both my fussy husband and son had unanimously agreed that this beef stew is tastier than the other one... See! Isn't it good that I'm not a boring person and I like such domestic challenges? LOL! Here's a video showing I cooked this extra extra flavoursome red wine beef stew. HIGHLY RECOMMENDED if you like bacon and of course, beef stew. LOL! Here's the extra flavoursome red wine beef stew recipe that I have adapted from here, here, here, and here. This is a freezer-friendly recipe. I usually cook this massive amount at go and keep the leftovers in a freezer for up to 1 month for our fuss free weekday dinners. Place beef in glass tray/s or container/s with red wine, whole garlic, and bay leaves. Cover and place in the refrigerator to marinate overnight. Remove beef from the marinade. Keep 500 ml (about 2 cups) of the marinade and discard the rest. Combine beef, flour, salt and pepper. Set aside. Heat 1 tbsp cooking oil a large frying pan with medium heat. Cook bacon for 5 to 7 mins until golden brown and the fat is released. Transfer the cooked bacon into a plate, leaving the fat in the pan. Add 2 tbsp cooking oil into the same frying pan if necessary. Cook beef over medium high heat in 1-2 batches if required for about 5-7 mins until lightly brown. Transfer onto a plate and set aside. Note: It's ok that the flour coating will stick onto the pan more easily. To fix this problem, you will need more cooking oil to sear the beef and also a lot of pan-scraping while cooking the onions later. Reduce heat to medium-low, add onions into the frying pan and cook for about 5 mins until the onions are fragrant, golden and softened. While cooking the onions, use a scratch-proof / wooden spoon to scrape the bottom of the pan. Add garlic mince and cook for about 1 min until fragrant. Add 500ml of the reserved marinade and cook over high heat to bring it to boil. Keep scraping the bottom of the pan to de-glaze. Remove from heat. Add beef stock, Worcestershire sauce, 1 tsp salt and 1 tsp pepper. Taste and add more salt and pepper if required. Add carrots, potatoes and mushrooms into 1) a pressure cooker if you want to cook your stew for about 1 hr or 2) a non-stick large (6L or anything larger) cooking pot with a tight fitting lid if you want to cook your stew for 2 hrs or 3) a large (6L or anything larger) Dutch if you want to slow-bake your stew for 2 hrs or 4) a 6L (or any larger) slow cooker if you want to cook your stew for 8 hrs. Then, add the seared bacon and beef with all their juices, the red wine gravy and rosemary. 1) cook for 40-60 mins with medium pressure if you are using a pressure cooker. 30 mins if you are planning to keep the stew in a freezer. Or 2) cook for 2 hr if you are using a regular non-stick cooking pot. Use medium high heat to bring mixture to boil first, then reduce heat to low and cook for about 2 hr or until beef is tender. Or 3) bring mixture to simmer on the stove with medium heat if you are using a Dutch oven to slow bake. While the mixture is cooking on the stove, preheat oven at 250˚F or 275˚F. When mixture is simmering, place the Dutch oven into the preheated oven and bake at 250˚F or 275˚F for 2 hrs or until beef and vegetables are tender, stirring once during cooking. 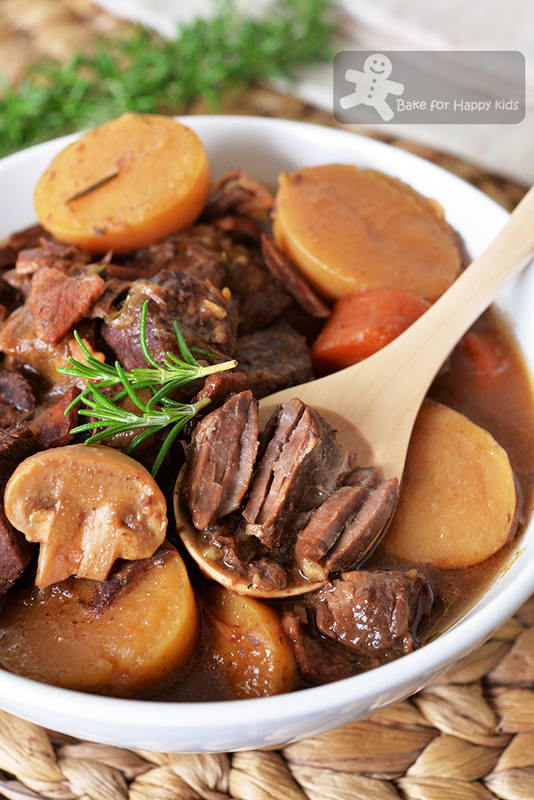 If the stew is boiling rather than simmering, lower the heat to 135˚C / 275˚F or a slightly lower temperature. Or 4) cook for 8 hr if you are using a slow cooker. IMPORTANT: Cooking timing might vary due to the cut of the beef that you used. Please make sure that the beef has to be cooked or baked to tender. When the stew is done and the meat is tender, remove 1 cup gravy from the stew and whisk 2 tbsp flour into it. Pour mixture back into the stew and simmer the stew for about 3 mins or until the gravy thickened. Season with salt and pepper if required and serve while it is hot.